Wow, what a busy day this was. In fact, it was so busy, by the time I post this blog, WordPress will already think it is Sunday, January 29, but it’s not. It is still Saturday, January 28, 2012, and we will probably be here at the Creative Arts public charter school until 9:30 pm. Long day, but really satisfying. From left to right: Tom Lopes (seated), Harley Strazzarino (back to camera), and Grant Bowman (red jacket). We arrived at 10:00 a.m., and got right to work, triaging computers. We triaged a total of 20 computers, and we installed 11 of them in the class rooms of Maria Jenerik and Dina Moskowitz. Maria teaches 6th, 7th, and 8th grade social studies and math, and Dina teaches 6th, 7th, and 8th grade language arts and math. Here is a shot of Grant Bowman, Tom Lopes, and Harley Strazzarino in the triage room (the library) discussing some of the finer points of system administration. Many of the machines that we installed today were the machines that were donated yesterday, Friday, January 27, by Mr. So Trinh, an IT Director at San Francisco State University. Once again, many thanks to So and SFSU for those donations! 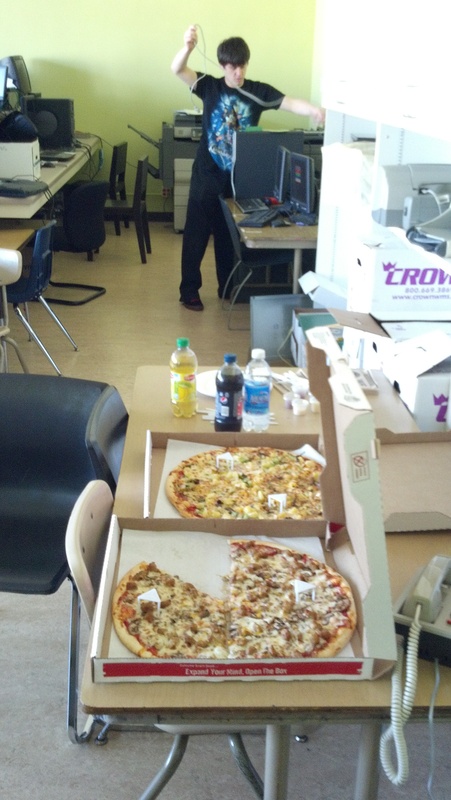 We actually were here so long today, that we had two rounds of pizza! The first round arrived at 1:00 pm, and the second round arrived at 4:00 pm. The first round was 2 extra large pies, the first featuring sausage and mushroom, and the second was our traditional Partimus broccoli and pineapple pizza for which we are so very famous. At the end of the day, here is a picture of the small room where 7 of the 11 Ubuntu GNU-Linux comptures will be used by the students. They will start right away on Monday by putting together a yearbook, under the direction of Maria Jenerik. 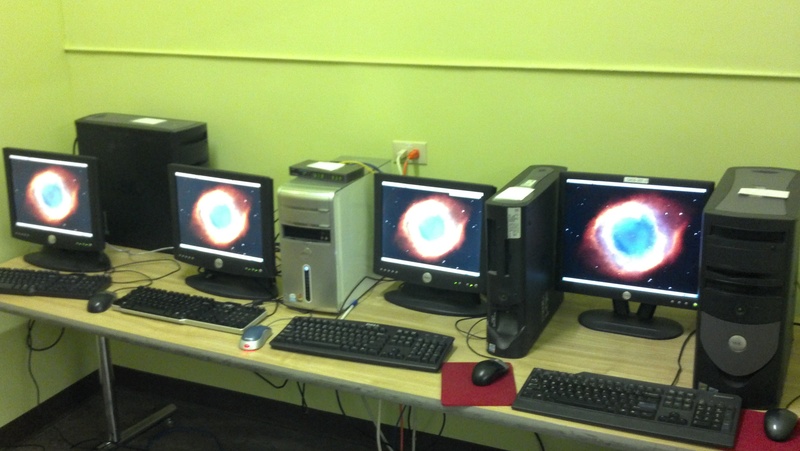 All of the computers pictured here were free of cost to the Creative Arts public charter school. The machines were donated, and the software is free open source software, which is the product of millions of hours of work by developers all over the world. I find it to be such a beautiful statement about humanity that so much free goodwill is donated to the proposition that software should be made available to everyone, regardless of income. In the next post I will included a shot of the team that did the installation work today. So it was a long, long day, but I think that I can speak for the whole crew when I say that we had a feeling of great accomplishment. Many thanks to everyone who participated! This was written by Christian Einfeldt. Posted on Sunday, January 29, 2012, at 4:26 am. Filed under News. Tagged Creative Arts Charter School, Triagefest. Bookmark the permalink. Follow comments here with the RSS feed. Post a comment or leave a trackback. My stepson just started attending Creative Arts in January, and he likes Ubuntu. This is exactly the use I’d like to see free software put to, and I’m glad you folks are doing it.